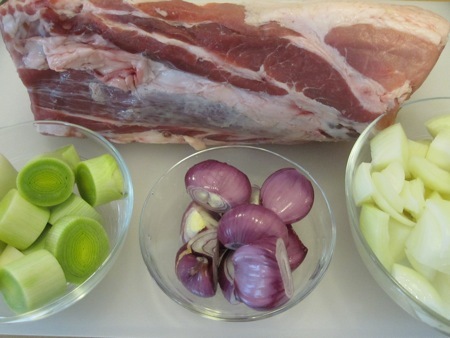 for a simple preparation that will respect the pig. I had a large pork loin (part of my quarter hog delivery last month) and dinner guests due on the weekend, so I chose this roasting method. I started with the pork. 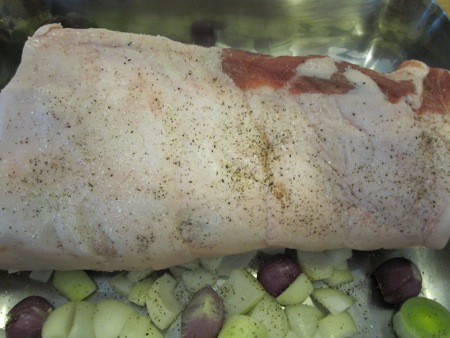 I had a seven and a half pound loin, two chopped onions, a handful of large shallots, and two leeks cut into one-inch rounds. Henderson calls for a smaller roast (five and a half pounds) with the skin still on, but I knew that the cooking time wouldn’t change. He uses only onions, but I added the leeks and shallots for a bit of extra flavor and sweetness, as well as some extra padding for the bottom of my large roasting pan. I tossed the aromatics into the pan, placed the loin on top, and seasoned with salt and pepper. The recipe states that the roast should cook for two and a half hours in a 425 °F oven, but I was using my oven’s convection roast setting, so I knocked the temperature down to 400 °F. 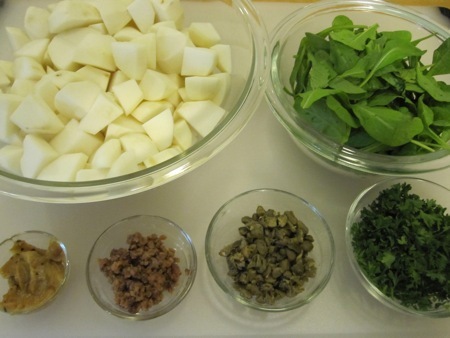 While the pork cooked, I assembled the ingredients for the side dish: twelve small turnips, peeled and chopped; about two cups of arugula, standing in for the missing turnip greens; a “handful” each of chopped curly parsley and chopped capers; a small can of anchovies in oil, drained and chopped; and an entire head of garlic, roasted and mashed. I whisked together a “splash” of red wine vinegar and a “healthy splash” of olive oil, translating Henderson’s less than precise measurements into a two-to-one ratio of oil to vinegar. 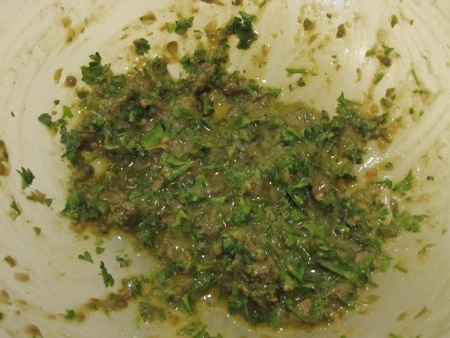 I stirred in the remaining ingredients and corrected the seasoning with some back pepper. The roast came out of the oven and rested for twenty minutes. 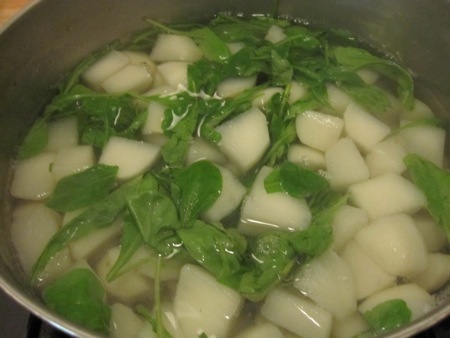 During the resting period, I boiled the turnips for about fifteen minutes, until they were tender. When they were done, I tossed in the arugula to wilt. 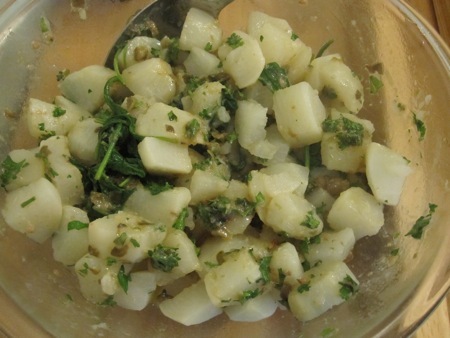 I drained the turnips and greens, then tossed them with the garlic and anchovy dressing, just as you would dress a potato salad while the potatoes were still hot. 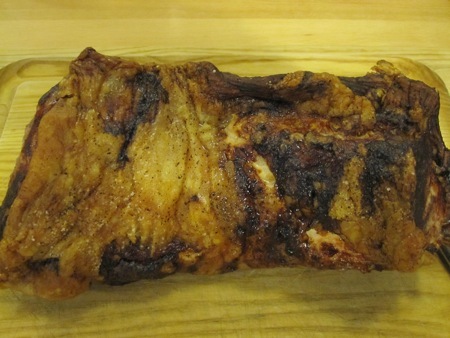 I sliced the loin into thick chops, using the space between the bones as guides. To plate, I laid a chop on top of a pile of turnips. 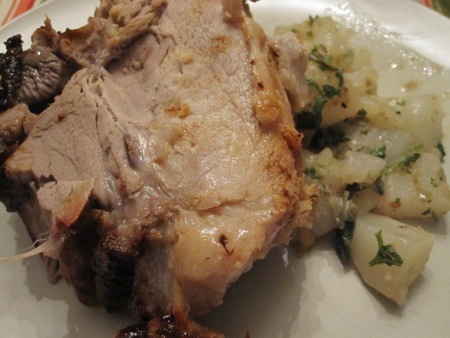 The pork was cooked slightly past the still-pink stage that I prefer, due to my inexperience with the convection setting, but it was still tender and scented with the aromatics. Much to my surprise, the thick glaze at the bottom of the pan was ignored; I followed the recipe to the letter this time, but the next time I’ll make a jus from the pan drippings. 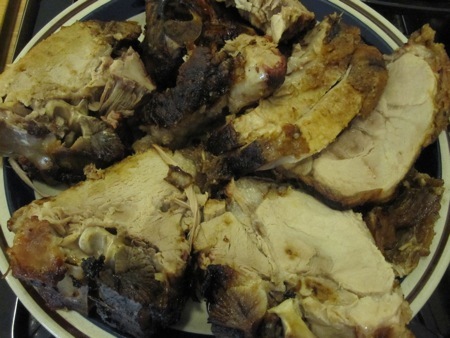 The only thing that could have improved the pork was adding chopped bits of roasted skin, but I didn’t have that luxury. 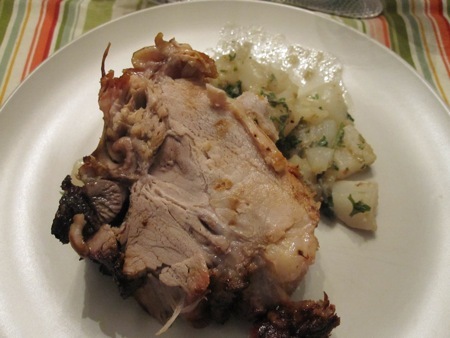 The turnips were just like a potato salad: the vinegar cut the richness of the pork, while the anchovies and garlic added salt and sweetness. I liked them so much I wil probably use them as an accompaniment for other roasts. This meal demonstrated what I love so much about Henderson’s cooking: a huge amount of flavor for a minimal amount of effort. I finished this fine English roast supper with a banoffee pie, but you can find that recipe yourself. I can’t wait to make this myself!